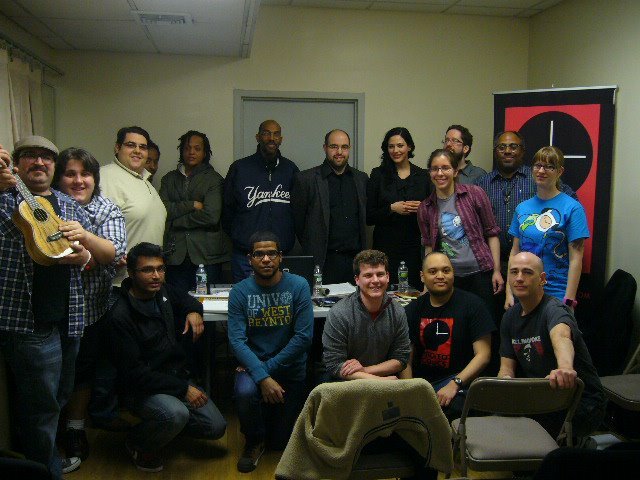 On July 5, Pronto welcomed famed comic artist Phil Jimenez to our monthly podcast meeting. You’ll recognize Phil’s name from his work on DC’s Wonder Woman (2000-03) and the 2005-06 Infinite Crisis series, as well as Vertigo titles Swamp Thing and The Invisibles, the Barack Obama cover of The Amazing Spider-Man, and many others. Phil had a shockingly straightforward start in comics. He went to New York’s School of Visual Arts (at the time one of only two U.S. schools with cartooning programs), but was forced to drop out after only two years when he could no longer afford the cost of tuition. He sent out his portfolio to a handful of publishers, and just before he was ready to head back to his hometown in California, received a phone call from DC. As for the modern comics era, things are far different now. There’s generally no such thing as a “staff artist,” and most companies (Marvel and DC included) do not accept unsolicited manuscripts or portfolios. If you do want to break into the industry, though, there is one skill that matters just as much now as it did 20 years ago: the ability to tell a story sequentially. Shortly after first being hired, Phil was told that that’s why he’d been selected—not because he could draw. Further, there’s more to drawing compelling characters than their faces. Body language and behavior are just as important in creating a personality on a page. Phil lamented the tendency for many characters to look the same, and seemed disappointed in the fans who like that look. Phil also denounced any sort of diva attitude. He said that when the writer or employer says they want something, it’s the artist’s job to give it to them. He referred to himself a “hired hand,” though not in a bad way. After all, Phil gets to draw his childhood heroes for a living—even if he may be dismayed by the direction a story takes, you really can’t beat that. Click here to listen to the complete interview with Phil Jimenez. I spent the first week of June in Belgium, on a foodie press trip, courtesy of one of my “real” jobs, and planned by the organizations Visit Belgium (www.visitbelgium.com), Visit Flanders (www.visitflanders.us), and Visit Brussels (www.visitbrussels.be). While I was really excited for all the cheese, chocolate, and beer I planned to consume, I was also really excited to see the comics museum and comics murals in the city of Brussels. Belgium will forever be tied to comics thanks to the fact that it’s the home country of Hergé, the creator of a little comic you may know by the name of TinTin. But I had no idea to the full extent the country embraces and respects the medium of comics until I got there. Comics receive a totally different treatment in Belgium (and France too, where I’ve traveled more extensively) than the US. For one thing, comics are not treated by non-fans as something “just for kids.” It’s treated as a medium for all ages. Even the titles geared toward children are read by adults, with no shame. 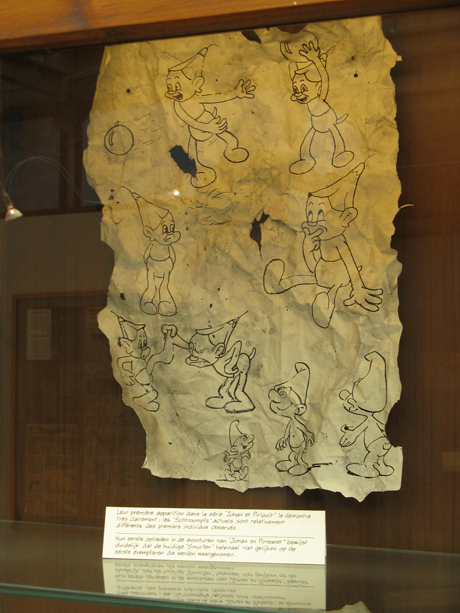 An early, original sketch of The Smurfs in the Comic Strip Center museum in Brussels. 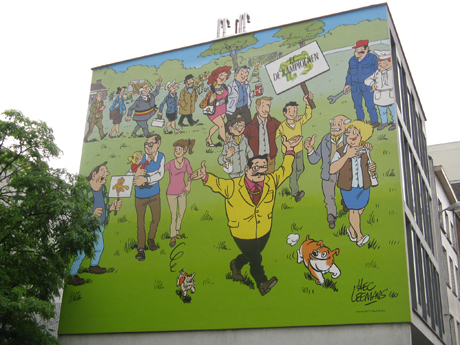 Comics are treated as an important cultural legacy in Belgium. Sure, in New York City we have the Museum of Comic and Cartoon Art, but Brussels has the Comic Strip Center, the Marc Sleen Museum, Hergé Museum, the Maison de la Bande Dessinée (“Comics House”), the Maison Autrique (another gallery that exhibits comics art), and the Museum of Original Figurines, showcasing toys and figures based on comic characters. And let’s not forget about the comics murals all over the city. Brussels is covered in these things—more than 30 in all. There are also a few statues scattered around too. They’re not all in the center of the tourist area, either. I spent hours walking through residential neighborhoods in an effort to see and photograph every single one, but just couldn’t get to them all. 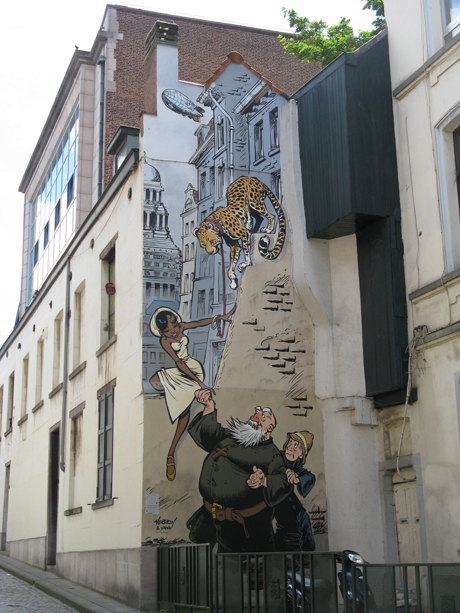 There are also murals in the cities of Antwerp and Turnhout. But it’s not just Belgian artists that the country embraces. American, Japanese, and other countries are equally read, if not equally celebrated. 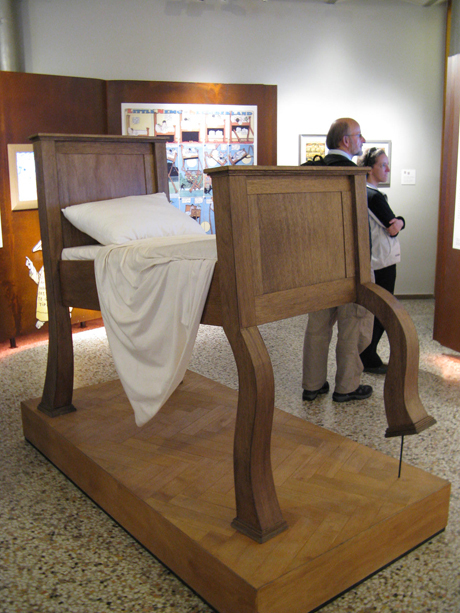 One of the first items you see in the Comic Strip Center museum is a life-size replica of the walking bed from early American newspaper strip Little Nemo in Slumberland, followed by a written history of comics that starts with the American newspaper strip, The Yellow Kid. 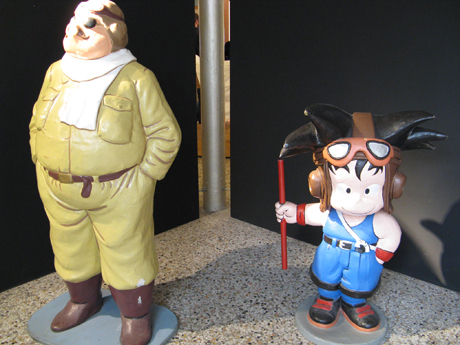 There were also life-size statues of Studio Ghibli’s Porco Rosso and Goku from Dragon Ball. (By the way, if there’s ever a manga title you’re desperate to read that isn’t available in English, and you understand French, check France’s Amazon.fr, as far more titles are translated to French than English). 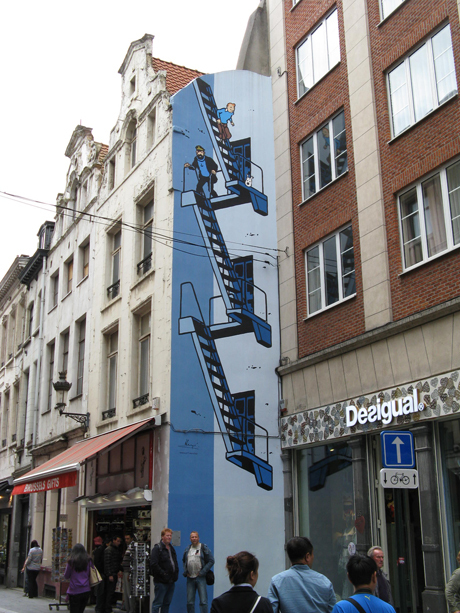 If you’re looking for a comics-focused vacation, Belgium is definitely the place to go! On April 5th Pronto Cast featured our very first female guest for the podcast: writer, poet, and all-around Renaissance woman Andrea Grant. Andrea writes the comic (“I can’t draw,” she says). The first four issues of “Minx” were recently collected into trade paperback format, and can be purchased through her website, or in stores through Diamond Comic Distributors (if you can’t find it, ask your local comic retailer to order it). If the comic’s title sounds familiar, you may be thinking of DC’s cancelled “Minx” imprint of graphic novels aimed at teen girls. Interestingly, DC actually sent a cease and desist letter to Andrea over the shared name, and a lawsuit resulted. But “Minx” the alias first appeared in 2001 and the planning for DC’s imprint began several years later. “Minx” is a self-publishing success story. Andrea felt that no publisher would “get it,” and that it was up to her to make the comic the best it could be, instead of relying on a traditional publisher. She found her artists by “walking around a comic con,” and got the work out there by simply pounding the pavement. “People will sense your passion, and value that,” she says. Now the first three issues are sold out on Andrea’s site, there’s a full-color graphic novel, and the series has been written up in The Village Voice, Newsarama, Examiner.com, and a slew of other publications and websites. It’s an inspiration to all us self-publishers. Andrea can be followed on Twitter @copiousamounts. The entire podcast will be up on Pronto Wednesday April 25th.